By Vesna Madzoski on Wednesday, September 8th, 2010 at 12:00 pm. If our eyes were to be turned into a camera, it would be a rather poor device. 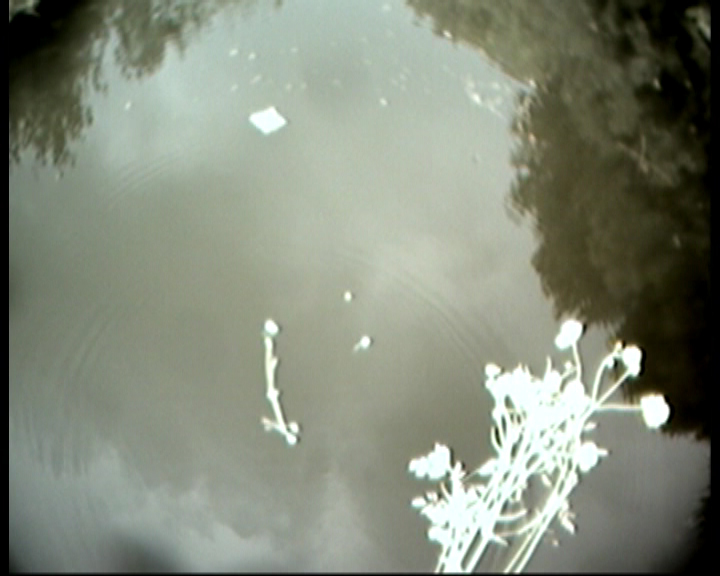 More precisely, it would not resemble a single-frame snapshot camera, but a video stream of a mostly blurred visual field with only spots of clarity. Our eyes move rapidly and continuously update the image in the brain, and it has been concluded that the brain, resembling a high-tech processor, cleans up the received input. Paradoxically, one of the functions of photography is to remind us of the impossibility of our eyes to perceive reality as a still image – as the saccadic scanning of our eyes show, there is nothing fixed or stable in nature. 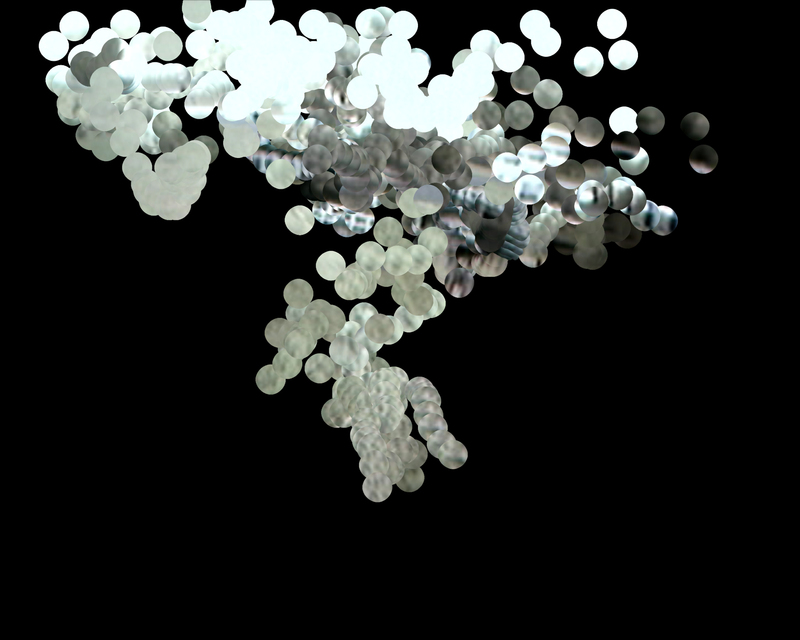 Matter is always in flux. In his artistic practice, Rune Peitersen explores precisely this aspect of the visual apparatus through a research project he started two years ago. 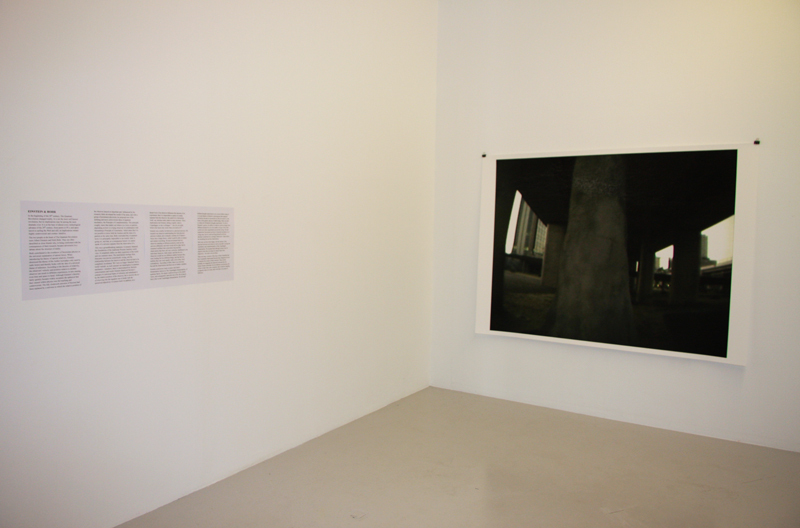 This summer, he presented the most recent series of his results in Ellen de Bruijne Projects in Amsterdam, in a show entitled “Saccadic Sightings: Einstein and Bohr.” In a secluded room, one was able to indulge in the three main elements of the show: a short text on Einstein and Bohr, Observing Uncertainty – an enigmatic large photograph of a hallucinatory scene covered with a map of small printed squares, accompanied by Observer Effect – a series of smaller black photographs with dots of visual clarity representing each of the square from the large photograph. These questions led Peitersen to the discovery of the Mobile Eye, a device normally used in scientific research in order to track the human gaze and decipher visual impulses imperceptible due to the power of the brain to erase visual ‘noise’. Peitersen used this tool to record his eye movements in various situations, from a simple visit to the park or a stroll around the building to more intimate settings, like his bedroom. The result were videos of uncanny beauty, in green-gray colors, resembling more a recording of somebody’s nightmare experience than the record of a full-colored reality as we normally see it. The first series of photographs entitled Homunculus (2009) was Peitersen’s first step in working with the visual results. 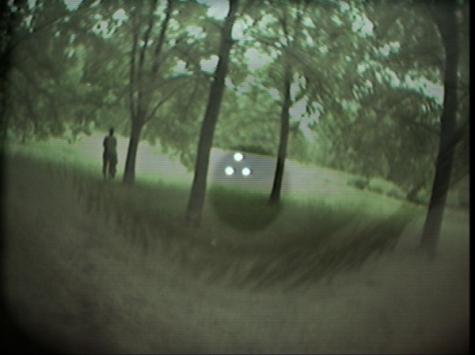 Here, the green-gray images of the scenes recorded while wearing Mobile Eye are overlapped by an image of the all-observing eye. In naming his first series “Homunculus” – a term used in scientific research to designate “the little man inside the brain” – we can read Peitersen’s desire not to stop at that point of investigation, seduced by the hallucinatory nature of the images. Instead, he had decided to continue further with questioning the contemporary definitions of how this little man sees and how this interpretation is shaped by the culture. The following step was to ask somebody else to wear the device and to use scientific methods to reconstruct the visual perception of the other. 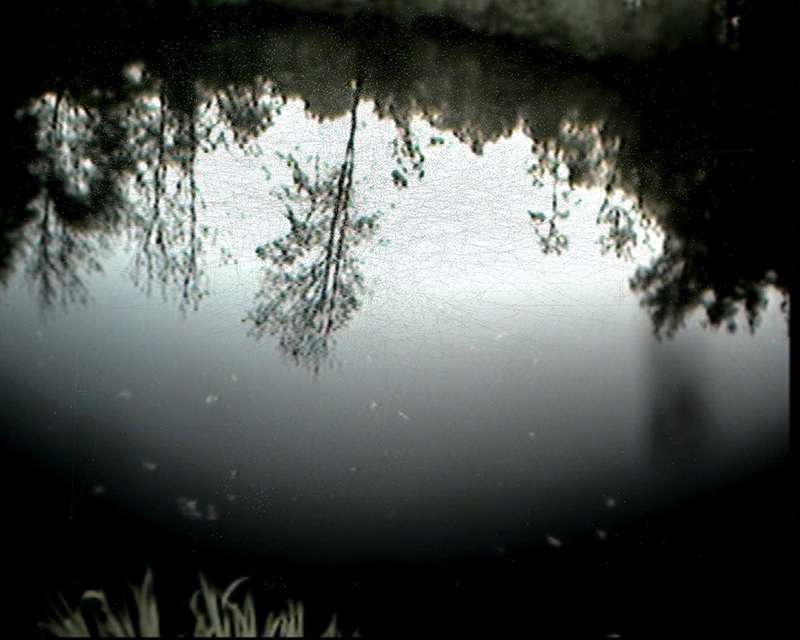 This video material was first presented in Amsterdam in a show entitled “Saccadic Sightings: Ophelia” in 2009, accompanied by photographs of the same visuals. 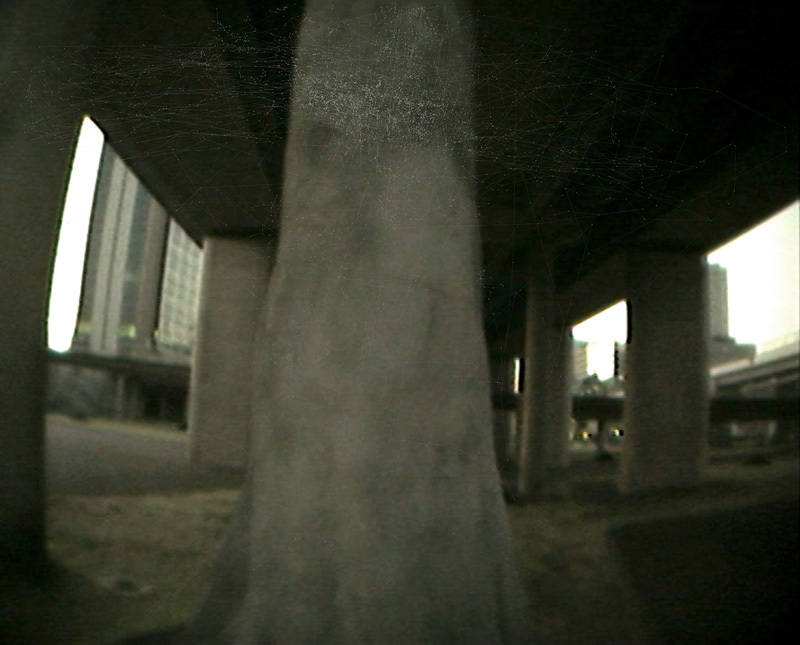 In the single-channel video projected in a dark room, a viewer was confronted with the uncanny feeling that stems from the sensation of entering someone’s intimate world. In this work, one becomes a woman who runs through the fields, picks flowers, lets them float in a nearby spring, and then abruptly wakes up at the end of this dream-like sequence. Peitersen’s attempts to translate and understand somebody else’s experience of reality brought him to science. What seemed to be the most striking revelation to him was that the quantum revolution, although it transformed the science of physics and had major practical implications on technology, did not manage to disturb Cartesian definitions of how we perceive reality in our everyday lives. In other words, we are still trapped in the world of Newtonian physics and never made the step towards truly understanding and integrating Einstein’s postulates. This striking revelation seems to have prompted his questions even further into the direction of how an artist, assuming that art has the power to change the way in which we perceive the world, can help this revolution take place on the level of the visual. Is there a real power in art of doing so, or are we led into yet another deception of the mind? Peitersen turns to history to help address this question. The story about the close friendship between Einstein and Bohr, and their contradictory positions on material reality, is the theme underlining Peitersen’s show “Saccadic Sightings: Einstein and Bohr.” Einstein’s revolutionary discovery from the beginning of the twentieth century indirectly proved the non-existence of objective material reality; nevertheless, he had spent most of his late years trying to prove he was wrong. From his side, Bohr had embraced and deepened new discoveries in the sub-atom field, sketching the theory that solidified reality exists only through the eyes of the observer. In spite of this, what we witness in the decades that followed was the growth of the Cartesian division and supremacy of the brain, following the supremacy of the eye stimulated by the media. The remaining question is if this cultural training of sensory segregation actually erases the possibility of not only a true perception of reality, but also of the possibility to tune into somebody else’s world view. In Peitersen’s last show, the uncertainty of one’s perception and the particular reconstruction of the reality in the eye of the beholder reveals accordance with Einstein’s and Bohr’s early findings, prompting us to revision what we thought of vision in the first place. Hence, Observing Uncertainty reveals the ungraspable nature of observed reality, while the Observer Effect further translates the effect a beholder has on the observed. In both works, our vision appears to be out of control, where the final image resembles more a dark square disturbed by small fields of clear and focused vision. The rest is being reconstructed and re-imagined by the brain, a powerful machine that decides what we actually see in the end. The mode of viewing elaborated by these works uncovers how we are locked within the safety of Cartesian division and illusion of the brain’s mastery over matter. In order to see or feel like others do, we will perhaps have to turn to the undisciplined, uncivilized segments of our senses. If our mind has a problem of understanding the transformed reality after Einstein and Bohr, maybe we should look for the help of other senses in helping us to truly perceive this. Nevertheless, what we should always have in mind is that the moment we think we got it all, it is already gone. And the “Saccadic Sighting” is there to point this out. Posted in: Texts, Saccadic Sightings, Texts. Tags: Saccadic Sightings Texts.